Part 1 Principles of Strength Chapter 1 Understanding Strength By defining the variables of strength, we identify the tools we can use in the journey to become the strongest, best versions of ourselves. DEVELOPING STRENGTH IN LIFE Your definition of strength should not be limited to pounds lifted, speed of miles run, or number of minutes working out. Strength isn’t only about numbers. It can be the ability to work a physically demanding job while still having the energy to play with your children at the end of the day. Or it can be enjoying painfree hiking and biking with your friends and family on the weekends. How do you develop this kind of strength? True strength is derived from the intersection of a strong, balanced diet, regular physical activity and good health. The question isn’t, “diet or exercise?” “Run outside or enjoy a meal with loved ones?” It’s not about or – it’s about and. Enjoying the synergy between food and fitness is how you develop strength. What makes the pursuit of strength so powerful is that these components are interrelated. As one or more components improve, your capacity to improve the others increases. For example, throughout life, studies show that regular physical activity combined with a consistent, balanced diet with protein-rich meals helps: Strengthen your mind as well as your muscles, improving your mental health1 Build and maintain muscle, a key marker of health and longevity2 Support heart health by lowering cholesterol and blood pressure levels3,4 Maintain a healthy weight, taking stress off your joints and lessening the likeliness of pain5 These are just a few examples of how a balanced diet, regular physical activity and good health intersect to create greater strength. This field manual puts the greatest emphasis on nutrition and a balanced diet. The science of each component is explained, and practical ways you can implement an eating style that helps you be your strongest and best self are provided. Several key nutrients integral to building and maintaining a strong mind and body are central to this dietary approach. Lance Pekus is a husband, father, cattle rancher and Cowboy Ninja. As if working hard on his Idaho cattle ranch all day isn’t enough, he also makes time for the agility, strength and obstacle drills for his ninja training. For Pekus, it’s not just about being physically strong to achieve success. He says he derives his greatest source of strength from his family. To me, strength comes in all sorts of forms. My kids are strong to me. The strength they show when they’re runnin’ around and they fall over and just get up, dust themselves off and say, “I’m okay.” That’s strong. And my wife, what she goes through physically and mentally every day with us, that’s strength. A lot of people say I’m strong, but I look at people in my life, and I’ve got family strength. You know—the closeness we have with my wife’s family and working with my father-in-law, and having dinner with them. Being able to sit down at a dinner table with family and either eating something I cooked on the grill or a roast that’s been cooking all day. That builds family strength, emotional strength and mental strength. From his physique to his performance on the ninja course, Pekus embodies physical strength. Like all of us, though, his life is busy, and he needs to prioritize and get creative with his time and his training to fit it all in. We all can find inspiration in his “cando” attitude. Not everyone wants to go out and run a marathon, but if you just want to get out and get physically active, it’s just little by little. People think you gotta go out and kill yourself with the workout every day to get physically fit, but a lot of times I don’t have time in the day to go put a two- or three-hour workout in. I squeeze them in throughout the day. If I can get a five-minute workout in here and a five-minute workout in there, maybe throughout the day I might get a total of an hour- or two-hour workout, but it’s not all going to be at once. I believe a lot of people think, “oh I don’t have the time to go do that.” But while you’re thinking about the time you have, you have the time right then and there that you can do push-ups. You can do it, it’s just that mental attitude toward life. Principles of Strength Chapter 2 Nutrients Central to the Pursuit of Strength Fueling your pursuit of strength – your journey to be at your best – requires optimal nutrition. You want to function at your very best. One way to do so is to prioritize foods with the nutrients your body needs to thrive, such as protein, zinc, iron, B vitamins and selenium, as essential to your diet. PROTEIN Protein is a key foundational nutrient for supporting strength.6-8 It plays an important role in building muscle by providing your body with the building blocks needed to fuel recovery from physical activity.9 It also aids in maintaining a healthy body weight by helping you feel full long after your meal is over.10-11 In addition, protein supports proper function of the brain and immune system.12 Studies also show that protein is instrumental in controlling and reducing risk factors for cardiovascular disease such as high cholesterol and blood pressure.3,13 Most people eat enough protein to meet the body’s minimum requirements, but few get what many scientists see as the optimal amount needed for good health.14,15 You’ll find more information about optimal protein needs in Chapter 3. Neuro-nutrients: Vitamins and Minerals that Play a Key Role in Brain Health Zinc: Essential for proper growth and communication between neurons. Iron: Essential for the production of nutrients needed by the brain and is also used as part of the protective sheaths that cover nerves. Selenium: Needed for the formation and function of key antioxidants that support a healthy functioning brain. Vitamin B12: Needed for growth and development of nerves. Vitamins B2, B3, B6: The brain uses half of the sugar available for energy in the body. These vitamins are needed to convert that sugar into fuel for the brain to use. Protein: The brain uses protein 3-4 times faster than your muscles do. Protein also provides the building blocks for key nutrients needed by the brain. Part 2 Fueling Strength We have reviewed characteristics of strength, discussed the various ways you can develop it and highlighted key nutrients essential to it. When you sit down to prepare, order or eat a meal, the first question you should ask yourself is “Where is the protein?” Protein is an essential component for strength and it should anchor your plate at every meal. You can improve your diet by understanding when to eat protein and how to distribute your intake of protein throughout the day. This will help you: Support your body’s ongoing need to build and repair muscle14 Feel more satisfied during and after a meal40 Enhance your ability to recover from exercise41 Creating a nutritious, balanced meal is easy when you make protein the starting point of your meal and build the rest of the meal around it. PRINCIPLE OF STRENGTH: EAT FOODS THAT PROVIDE YOUR BODY MULTIPLE BENEFITS You should always strive to get the most out of what you eat. By focusing on foods that give your body multiple benefits, you improve the overall quality of your diet and minimize empty calories. Beef is a great example of a food that provides your body with multiple benefits in an efficient calorie package. While it’s best known for providing high-quality protein, beef also provides iron, zinc, B vitamins and selenium. Dr. Doug Paddon-Jones is one of the world’s most respected scientists in the intersection of protein, muscle, inactivity and aging. He is a professor of nutrition and metabolism, serving as the Sheridan Lorenz Distinguished Professor of Aging and Health at the University of Texas Medical Branch. Dr. Paddon-Jones is intensely interested in the minutia of how the body uses protein and activity to regulate, protect and build muscle at any age. Thankfully, he also has an intense desire to distill these findings into useful information for anyone striving to live a healthy life. People have a much greater appreciation for muscle after they lose it. Unfortunately, muscle is so easy to lose. If you spend 12 weeks lifting weights and working hard, you’d be fortunate to gain 2-2.5 pounds [of muscle]. But you can lose all that muscle you put all that time and effort into building if you are inactive for 7-10 days due to being sick or simply having to be at your office working more. So, when you are young and as you progress through your 30s and 40s, it is important to create the habits of being active and eating a moderate amount of protein at each meal to maintain and build your muscle reserves. These lifestyle habits will act as insurance policies later in life when you become sick, injured or just busy and at greater risk for losing muscle. People benefit from consistently focusing on eating moderate amounts of protein at each of their meals. Don’t let yourself get tripped up by the details of grams and counting macronutrients. This will free up a lot of mental energy. When you sit to eat, is there a portion of high-quality protein? If so, you are moving in the right direction for your health. LEUCINE: THE MUSCLEBUILDING AMINO ACID Protein turns on the musclebuilding switch in your body â&#x20AC;&#x201C; but not just any protein can do it. Leucine is the essential amino acid needed.51,52 Complete proteins, like beef, provide the leucine needed to build muscle. They also contain the full spectrum of amino acids your body needs to build and repair muscle. When Should You Eat Your Protein? Dr. Paddon-Jones and colleagues designed another study to determine a better way for people to eat protein throughout the day. Research shows that most of us eat very little protein at breakfast, a little more at lunch, and a lot at dinner.53 One group of study participants ate protein in the typical daily pattern of most Americans.14 A second group of study participants ate 90 grams of protein distributed more evenly throughout the day. When protein consumption was distributed evenly across meals, the researchers found that rates of muscle building and repair were significantly better at the end of the day.14 This is a great example of science showing that a moderate amount of protein (90 grams), if spread evenly across your meals, is optimal for strength through muscle maintenance. How to Get 30 Grams of Protein at Breakfast Start optimizing protein one meal at a time, beginning with breakfast. Eating protein in the morning sets your body up for metabolic success throughout the day by: Helping stop excessive muscle breakdown from your night of fasting/sleeping55 Reducing brain-driven cravings later in the day56 Improving blood-sugar control throughout the day57 Getting 30 grams of protein at breakfast is an extremely important foundational habit for a strong diet. You can hit this target with one 3.5-ounce piece of cooked sirloin, but finding ways to eat 30 grams of protein at breakfast can be more challenging. Protein stacking offers a simple solution. TAKE ACTION: PROTEIN STACKING Eating 30 grams of protein at breakfast is challenging because many traditional breakfast foods, like cereal, eggs and bagels, have lower amounts of protein. Still, 30 grams of protein at breakfast is very achievable. Think outside the box by using a process called protein stacking. Combine different sources of protein together and incorporate more non-traditional, protein-rich breakfast foods into your meal. Protein Content of Common Breakfast Foods* MYTH: Eating too much protein damages your kidneys. *See page 59 for nutrient content sources. Beef up your cheese omelet with a couple slices of sirloin leftover from last night’s dinner or a few spoonfuls of a cooked ground beef breakfast sausage. By stacking your protein sources, you’ll be well on your way to enjoying 30 grams of protein at breakfast every day. FACT: Research shows that when healthy people increase their protein intake, their kidneys adapt.63 It’s similar to how your muscles grow stronger when you lift weights. The kidneys are still able to do their job: filtering end products of protein metabolism. MYTH: Eating protein is bad for your liver. FACT: People with liver disease have trouble metabolizing proteins and building proteins from amino acids. However, increased protein consumption doesn’t cause liver disease. According to the U.S. National Library of Medicine, liver disease is most commonly caused by a virus (i.e. hepatitis A, B, or C), excessive alcohol consumption, certain drugs, liver cancer or genetically inherited liver diseases — not by eating protein.64 A healthy liver can process healthy protein intakes without issue. 8 oz low-fat milk: 8g Total Protein: 42g *See page 59 for nutrient content sources. MAXIMIZING PROTEIN TO FEEL FULLER, LONGER Managing hunger can be tricky because you feel hunger for different reasons. Your brain doesn’t tell you why, it just tells you what: you are hungry. Left unchecked, this hunger can drive you to eat excessive amounts or less-than-ideal foods and calories. Adding more protein at breakfast can help keep you satisfied throughout the day. Science shows that protein can help rebuff hunger by controlling the brain signals that tell us we are hungry. How Protein Makes You Feel Fuller and Less Hungry The most effective approach to controlling hunger is two-pronged. You want to: Increase feelings of fullness when you eat Decrease feelings of hunger between meals Protein has you covered on both fronts. Research shows that eating whole-food, high-quality proteins sets off a cascade of signals in your digestive system telling your brain you are full and satisfied.58,59 Proteins send out stronger fullness signals than fats or carbohydrates.58,60 Protein also controls your body’s ability to release ghrelin.61 Ghrelin is a hormone produced by your stomach that travels to your brain to flip your hunger switch. It’s the only known compound to stimulate hunger. When you start eating less, your stomach produces more ghrelin to encourage you to eat more. Research shows that when you eat protein, ghrelin levels decrease.61 This is one reason eating protein at every meal needs to be a cornerstone strategy of a strong diet. In a European study, almost 800 participants lost about 8 percent of their body weight and reached a healthy weight. Then, they focused on maintaining their healthy body weight for six months. The most successful participants ate the most vegetables and protein. These participants also had the highest rate of completion in the study, demonstrating that pairing protein and plants increases adherence to a diet.74,75 Let’s dig in to how and why half of your plate should be piled with vegetables and fruit. Source: United States Department of Health and Human Services, United States Department of Agriculture, United States Dietary Guidelines Advisory Committee. Dietary guidelines for Americans, 20152020. Eighth edition. Washington, D.C.: U.S. Department of Health and Human Services and U.S. Department of Agriculture; 2015. Fueling Strength Chapter 5 Cornerstone Three: Focus on Fiber-rich Carbs Carbs are a hot topic in nutrition, diet and health today. The previous chapter discussed the importance of pairing protein and plants at every meal. While vegetables and fruit contain carbohydrates, this chapter specifically looks at starchy vegetables, whole grains, beans and legumes. You can use higher-carbohydrate foods as a dietary tool to fuel your daily activities. Focus more on choosing fiber-rich carbs and less on good vs. bad carbs. This will make it easy to ensure you are getting the highest-quality carbs possible. 5 GO-TO FIBER-RICH CARBS* Whole-Grain Bread The right kind of whole-grain bread gives you fiber, nutrients and the versatility to make amazing, portable meals. Look for at least 5 grams of fiber per slice and the words whole-grain or whole-wheat at the beginning of the ingredient list. If you are trying to be carb-conscious, use one slice instead of two for an open-faced sandwich. Beans and Legumes Canned beans and legumes are a quick and simple way to boost the fiber content of a soup, stew, stir-fry or salad. Just 2-cup serving of beans or legumes can pack up to 6 grams of fiber.85 When buying canned beans, look for the low-sodium variety and rinse well before adding to your meal. Potatoes When it comes to getting the most bang for your buck, it is hard to find a carb nutritionally or financially superior to white potatoes. They are packed with fiber, potassium, vitamin C, B vitamins, and magnesium.85 When cooked and cooled, potatoes also create a unique fiber called resistant starch (RS).86 Research shows that RS can support healthy blood-sugar control, digestion and immune function.87,88 *See page 59 for nutrient content sources. TAKE ACTION: SWITCH TO WHOLE GRAINS Take a minute to think about the grains and starch-based carbohydrates in your diet. The U.S. Dietary Guidelines recommend that you make half of the grains in your diet whole grains.27 Which carbohydrates could be swapped out with a whole-grain, fiber-rich variety? What would the alternative be, and how can you incorporate it into your next meal to accompany the protein and plants on your plate? Chapter 6 Cornerstone Four: Fuel Recovery to Be Stronger In the previous three chapters we created a solid foundation to a strong diet. This diet is anchored in protein, piled high with vegetables and fruit, and finished with wholesome, fiber-rich carbs. We will now take a closer look at why nutrition is important for performance and recovery. This chapter takes our knowledge to the next level. Since an active lifestyle is a foundational component of strength, weâ&#x20AC;&#x2122;ll discuss how to use nutrition to support metabolic changes brought on by exercise. This will help improve how your body uses the food you eat and help maximize your recovery. PERFORMANCE AND RECOVERY Modern sports nutrition considers two main categories: performance and recovery. You can structure your diet to enhance performance in a desired activity. Appropriate nutrition also helps your body recover faster and more completely to prepare for the next time you work out, race or compete. Performance and recovery are not limited to those who consider themselves athletes. It applies to everyone who wants to be a little better the next time they embark on a physical adventure, whether thatâ&#x20AC;&#x2122;s a workout with a set of dumbbells in your garage, a hike, soccer practice or yoga. Depending on the timing and intensity of your exercise, your nutrition needs for optimal performance and recovery may vary — before, during or after your activity. Intensity Higher-intensity exercise relies more on your muscle’s carbohydrate reserves. The more intense your activity, the greater your body’s need to replenish carbohydrates afterward. To determine the intensity of your workout, see Understand Your Effort: RPE on the next page. Duration In general, longer workouts place greater stress on the body. Your recovery strategy should focus on rebuilding muscle as well as replenishing carbohydrates. For example, a 20-minute workout at a moderate intensity (such as a jog) simply requires staying hydrated and eating a protein-rich meal at least 1-2 hours afterward. But if you take that same moderateintensity workout and stretch it to 90 minutes, you will need to be more diligent about eating a planned post-workout meal containing protein (for muscle recovery), vegetables (for electrolytes, vitamins and minerals) and fiber-rich grains or starches (to replenish the carbohydrate stores in your muscles). This workout also requires that you hydrate beforehand and might require that you add a small snack during your workout to sustain your energy levels. Frequency How often you work out greatly impacts how diligent you need to be about your recovery plans. When you start a workout without having recovered from the previous one, you can’t perform at your best. This additional fatigue becomes a liability when compounded over subsequent workouts. For example, four higher-intensity workouts each week will require more of a focus on recovery nutrition than one per week. PRINCIPLE OF STRENGTH: THE MISSING KEY TO ACTIVE NUTRITION As you work through this section and create fueling and recovery strategies for physical activity, remember that context is extremely important. As the intensity, duration, and frequency of your workouts increase, so should your focus on nutrition for optimal fueling and recovery. Understand Your Effort: RPE The science and technology of measuring and monitoring exercise – and effort exerted during exercise – is a quickly growing field. Even in today’s world of bands, straps, watches and apps, low tech is sometimes the best tech. Try the Borg Rating of Perceived Exertion (RPE) Scale,89 pioneered by now-emeritus professor Dr. Gunnar Borg at Stockholm University. This scale from 6 to 20 is a simple way to rate and identify the amount of effort you are putting forth at any given moment during physical activity (like running) or activities of daily living (like doing chores). Using the scale below, identify the number that correlates with how you’d describe your exertion effort during an activity. None, Light, Fairly Light Reading a book, folding clothes, walking through a grocery store. This level of activity is not enough to speed your breathing. Somewhat Hard Activities that increase your heart rate and breathing but don’t leave you out of breath, such as brisk walking, canoeing or a leisurely bike ride. Hard Running, biking, swimming or lifting weights in a way that takes significant effort, increases your heart rate and leaves you out of breath. Very Hard, Extremely Hard The highest level of activity you can sustain to a burst of effort that you cannot maintain for long. 17-20 RPE ratings of 12-14 are considered moderateintensity activity. When your RPE hits 15 or higher, you’re doing high-intensity activity, which draws more aggressively from the sugar in your muscles. If you want to sustain this intensity for an hour or longer, you need to consume an easily digestible carbohydrate (like a sports drink or rice cake) at the 60-minute mark. TAKE ACTION: ANY ACTIVITY IS BETTER THAN NO ACTIVITY Being physically active isn’t defined by going to the gym. It can be as simple as doing several sets of push-ups and sit-ups before breakfast, walking up and down flights of stairs in your building for 20 minutes, or canoeing around a lake after dinner. In our world, physical fitness is becoming more and more driven by technologies, equipment and metrics. Don’t get distracted: the most important thing is still moving your body every day. START STRONG What to Do Before You Exercise The goal of pre-workout nutrition is to ensure you are not starting your training session with a nutritional and metabolic deficit. A great workout isn’t possible if you are running on empty. Staying Hydrated The easiest way to maintain a high level of performance is to stay hydrated, as water is extremely important to your body. Research shows that just a 2.5 percent decrease in body weight from dehydration can cause an elevated heart rate, decreased ability to regulate your body temperature (which may cause overheating) and increased perceived effort (exercise feels harder than it should).90 There are no hard and fast recommendations for staying hydrated. The amount of water you need to stay hydrated varies depending on factors like body size, climate and activity level. However, aim to drink at least one glass of water with each meal, between meals, before exercise and after exercise. STAY STRONG How to Fuel During Activity If your workouts are less than 90 minutes, the food and nutrients from your pre-workout meal should be enough to sustain you through your workout. However, if you are exercising in a hot environment at high intensities or for longer than 90 minutes, you may need nutrition during your workout to help you perform at your best.39 Eating during exercise helps replenish your bodyâ&#x20AC;&#x2122;s resources and enhance and maintain your performance. Just as there are many kinds of exercise, there are also many strategies for nutrition during training. While sports drinks are common, the intensity and duration of your activity should determine how you fuel, and you will probably find that water and whole foods work just fine. KEEP IN MIND Your body has carbohydrates stored up in your muscles to use during exercise, so you donâ&#x20AC;&#x2122;t need to replenish gram-for-gram. The next two pages provide advice on fueling several different activities: running or a game, a weight-training workout, and a hike. Regardless of your activity of choice, you can use a hybrid of these strategies to perfect your own fueling plan for exercise. A traditional sports drink contains about 15 grams of carbohydrates per 8 ounces. delicious package you can carry easily in your pack or pocket. You can find the recipe at BeefItsWhatsforDinner.com/ strengthfieldmanual. The American College of Sports Medicine recommends obtaining these electrolytes from whole foods, rather than from supplements or sports beverages.102 However, since losing just 2.5 percent of your body weight in sweat can lead to decreases in strength and performance, if you sweat heavily, sports drinks can help you stay hydrated and support healthful levels of electrolytes. It is important to keep in mind that sports drinks contain additional carbohydrates you may or may not need. Be mindful of the calorie content of sports drinks and choose ones that are in line with your exercise regimen and goals. PRE-WORKOUT VS. POST-WORKOUT PROTEIN Post-workout protein is one of the most discussed aspects of recovery nutrition. However, depending on the duration and intensity of your workout, the meal you eat before your workout may provide you with the post-workout protein you need. Protein consumed 90 minutes prior to 30 minutes of high-intensity exercise, or before 45 to 60 minutes of lower-intensity exercise, can serve as both your pre- and post-workout meal. Step 1: Get a Notebook Documenting what you eat with a notebook and pen is the simplest and easiest way to become more aware of the foods and quantities you eat each day. Step 2: Bite it, Write it It is that simple. Donâ&#x20AC;&#x2122;t try to record everything at the end of the dayâ&#x20AC;&#x201D;the longer you wait the fuzzier you get on the details. Make a habit of recording each meal and snack immediately after you eat it. Step 3: Be Specific Make your logs as specific as possible. In addition to your food, you can include specifics about the time (breakfast, lunch, pre-workout, etc. ), your location (home, restaurant, etc. ), where you got the food (cooked it, ordered it) and how you are feeling (tired, stressed, happy, etc.). These details give you greater insights into your eating habits and what drives your food choices. 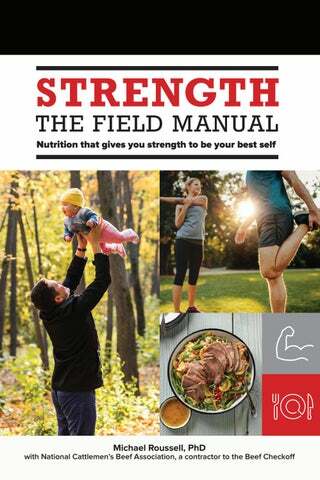 Part 3 Strength in Action Part 3 of this field manual will help you continually take steps toward the development of strength through proper food and fueling – wherever you are in life. The pursuit of strength is personal and unique. Perhaps you want to make changes to improve your overall health, train to achieve a personal best in a race, or maximize your mental or physical potential to feel your best. Whatever your goal, you reap the greatest benefit in your pursuit of strength from the pursuit itself. This is true when it comes to pursuing many nutrition, activity or lifestyle-improvement goals. Some people change how they eat because they want to lose weight; others want to improve a certain health parameter, such as lowering total cholesterol; and others want to get physically stronger or faster. Strength is derived through the process of making positive changes. Small, daily, consistent actions are the steps that keep you moving toward your bigger goals. If your big goal is to lose 10 pounds, you should focus on eating moderate amounts of protein and fewer total calories each day. If your primary goal is to complete a 5K race, you should focus on running 3-4 times per week. You achieve strength through daily actions that move you closer to your goal, regardless of your starting point. To help you take action, we’ll take a closer look into each of the components of strength. Strength = Balanced Diet + Physical Activity + Good Health Balanced Diet Various meal prep strategies in Chapter 7 help you make nutritious, quick and easy, protein-packed meals. In Chapter 8 you’ll also find a complete 2-day meal plan that demonstrates how everything comes together to form a balanced diet. Physical Activity In Chapter 6 you learned how you can use nutrition to fuel recovery from physical activity. In Chapter 9 we’ll discuss different targets for physical activity and how to get started, regardless of your fitness level. Good Health Maintaining good health in your life is the result of a variety of factors. In Chapter 9 we’ll also dive into how you can use recovery- and stress-management strategies, sleep and even just getting outside to support good health. Strength in Action Chapter 7 Strengthen Your Plate One Meal at a Time: Meal Prep Strategies The journey to strength includes devoting time to planning and building healthful meals. Taking the time to create quality, nutritious meals provides you with the energy needed to make it through even the busiest days. Meal planning doesnâ&#x20AC;&#x2122;t have to be time-intensive or fancy. It can be as simple as scribbling down meal ideas before you head out to the grocery store, calling your spouse on the way home to see what you have (or donâ&#x20AC;&#x2122;t have) in the refrigerator for dinner, or flipping extra burgers on the grill while the kids play in the backyard. Meal planning can be whatever it takes to follow the four cornerstones of eating previously discussed. Here are four foundational meal preparation strategies that will help you easily plan and prepare quality, wholesome meals regardless of your schedule: Modular Meals Strong Salad Matrix One Cut, Multiple Meals One-pot Meals These strategies give you flexibility to prepare balanced meals that work for you and your family without compromising nutrition, quality or taste. Pre-Cook for Faster Meal Prep Certain foods lend themselves to being prepared in advance. Use this to your advantage whenever possible as it allows you to prepare a meal in the moment. Brown rice can take 60 minutes to cook. You canâ&#x20AC;&#x2122;t get dinner on the table in 30 minutes if it takes 60 minutes for one component of the meal. A lean brisket or a pot roast can provide delicious, tender protein for multiple meals throughout the week, but it can take hours to cook properly. Find foods you enjoy eating that have a longer cooking time. Prepare and cook them on the weekends or during the week when you have extra time at home. If freezing pre-cooked food, portion and freeze the meals in ready-to-eat containers. If refrigerating, let the food cool before covering and storing in the refrigerator. Dinner for Lunch One of the most efficient ways to prepare lunches is to double up on what you prepare for dinner. Simply cook an extra portion for lunch the next day. TAKE ACTION: BUILD YOUR OWN SALADS FOR FAMILY DINNERS Choose one salad base and protein to anchor the meal. Add these to a bowl for each family member. Then lay out several bowls containing a variety of cut or cooked vegetables and starches/grains. Each person can add these to their bowl and build their own strong salad. This is a great way to get kids to explore and try new vegetables and food combinations on their own terms. Meal Repetition: The Missing Key to Success When planning your meals, donâ&#x20AC;&#x2122;t worry about eating the same dishes again and again. Yes, it is important to eat a variety of foods in your diet so that you can get a full range of vitamins and minerals. However, as you increase the number of different meals you eat during the week, you increase the complexity of following your diet. Greater complexity also means more ingredients to buy and more meals to prepare and cook. So, start simple and repeat. Find meals you like and eat them multiple times throughout the week. Breakfast is a great place to build in repetition. Pick two breakfast meals and alternate them during the week. The following week, swap in a new meal and repeat. You can also use one-pot meals (see page 41) that make multiple servings to fuel your lunch for the week. For many people, repetition is the missing key for a successful diet. Repetition makes execution easier, which leads to improved adherence to your diet, and better adherence leads to better results. In addition to repeating meals throughout the week, you can also repeat proteins that you ate at dinner as part of your protein stacking at breakfast (see Chapter 3). 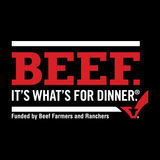 Donâ&#x20AC;&#x2122;t forget USDAâ&#x20AC;&#x2122;s food safety tips: Raw cuts of beef should be cooked or frozen within 3-5 days of purchase. Ground beef and stew meat should be cooked or frozen within 1-2 days of purchase. Combine 2 cup Italian dressing, 4 cup fresh lime juice, 1 Tbsp honey and 12 tsp ground cumin in a bowl. Add to a food-safe bag, then add beef. Coat beef with marinade and seal bag tightly. Place in refrigerator for 30 minutes to flavor strip steak or 6 hours to tenderize flank steak. USDA food safety tips: To help ensure food safety and keep bacterial levels low: • Cook or freeze fresh ground meats within 2 days • Refrigerate fresh meats at 40 °F (4.4 ºC) or below and freeze at 0 °F (-17.7 ºC) or below. • Cook raw ground beef to an internal temperature of 160 °F (71.1 ºC) as measured with a food thermometer. ONE-POT MEALS One-pot meals, like chili or stew, tend to require a small amount of upfront work and a longer cooking time – but once they’re in the pot, they don’t require much more effort. This makes them ideal for cooking on days when you will be at home but can’t spend hours in the kitchen. Make multiple servings and easily scale up or down to make more or fewer servings based on your needs. Require a little bit of prep work but cook for several hours with minimal attention. Can be portioned and frozen so that you have readyto-eat meals whenever needed. Strength in Action Chapter 8 2-Day Meal Plan Strategy Sometimes the easiest way to begin something new is to follow a specific roadmap. This 2-day meal plan will help you see what optimal portions look like and how you can combine simple, whole-food ingredients to make delicious meals to fuel your daily life. Strength in Action Chapter 9 Lifestyle Habits That Build Strength High-quality, delicious foods provide nutrients to fuel strength, but what you do with that fuel is just as important as the fuel itself. The following four lifestyle habits are important in supporting strength: Physical activity Sleep Recovery Time outdoors Let’s look at these and how you can use them in your life. STRENGTH THROUGH PHYSICAL ACTIVITY Regardless of your personal definition of strength, physical activity is important. Being active has the power to strengthen your mind, heart and muscles throughout your life. The 2018 Physical Activity Scientific Guidelines Report states: Physically active individuals sleep better, feel better, and function better.94 There are many types of exercise and many different ways to be physically active. Don’t get overwhelmed. Instead, start slow and make it fun. Aim to develop and foster habits and practices that you can sustain in one form or another for your entire life. Rushing and pushing yourself beyond your abilities can lead to injuries. As you develop your physical fitness, your body will strengthen and be able to handle longer and more intense physical workouts. Make Physical Activity Fun and Challenging The best kind of physical activity is the kind you do regularly. So, do things you enjoy and find challenging. These two factors will help solidify physical activity as a mainstay throughout your life. The enjoyment will keep you coming back day after day, and the challenge will push you to be a little better and work a little harder each day. TAKE ACTION: 4 WAYS TO GET MORE QUALITY SLEEP 1. Make sleep a priority. Plan the time you go to sleep and wake up to ensure you get 7-9 hours of sleep.106 2. Create a routine. Quality sleep is part physical, part psychological. Create a bedtime routine that signals to your body it is time to wind down and get ready for sleep. 3. Sleep in a dark, cool room. Light and warm temperatures can decrease the quality of your sleep.107,108 4. Cut out caffeine early. Individual sensitivities to caffeine vary, but it remains in your body for more than 6 hours. If you are having trouble settling down, stop drinking caffeinated beverages by 3 p.m.
1. Focused Breathing Breathing is an amazing tool for promoting recovery, as it can directly impact your heart rate and your body’s stress response. Taking extended exhalations stimulates the “rest and digest” part of the nervous system, lowers heart rate and helps control stress.110 Taking one or two minutes at different times during your day to slow your breathing is a simple way to promote recovery. STRENGTH THROUGH NATURE The pursuit of strength in your life should be one that brings joy and happiness, and nature has a unique and beneficial effect on our wellbeing. Research from Stanford University demonstrated that a 50-minute walk outside in a natural environment can improve mood and memory.116 Another study found that people who regularly took walks in the woods had lower blood pressure and lower levels of stress hormones.117 Other research showed that your mind can tell the difference between looking out a window to observe nature versus looking at a screen designed to simulate nature.118 The latter doesnâ&#x20AC;&#x2122;t have the same benefit. Just get outside! 1. Bring a Friend Exploring and enjoying nature doesnâ&#x20AC;&#x2122;t need to be an act of solitude to reap the wellness benefits. Team up with a friend and explore together, whether you take longer hikes on the weekends or brief walks in the park at lunchtime. 2. Be Prepared Spending time outside in nature should be enjoyable, so make sure that you have water, the right footwear and protection from the sun. 3. Have No Agenda Focus on enjoying, not achieving. You can count reps when you are in the gym and track your average running speed per mile when training for your 5K. When you get outside, just be outside and enjoy. Hollie Kenney is a running, swimming and biking coach for endurance athletes around the world. Being a professional triathlete herself for 26 years, Hollie knows what it takes to develop and sustain both physical and mental strength. This past year she had one of her biggest tests of strength when she summited Mt. Kilimanjaro with her 7-year-old daughter, Montannah, who became the youngest person to reach the top of Africa’s highest mountain: People are always surprised when they read about our journey up Mt. Kilimanjaro because it sounds shocking. It was an amazing feat, but it was also in line with the physically active culture of our family. We are very physically active. Montannah has watched me compete and coach various endurance events around the world for her entire life. The foundation of the physical strength that we needed for the Kilimanjaro journey is something that we had been building every day of our lives due to the active lifestyle we live together. Hollie believes that summiting Mt. Kilimanjaro required more of her mental than physical strength. I learned at a young age, through athletics, that mental strength is important. I’ve tried to bring those learnings into my life as a parent. Montannah and I always talk about making decisions vs. goals. A goal is something you would like to have happen but making a decision is different. Once you decide, you make it happen. Montannah had made a decision to get to the top of Kilimanjaro and she made it happen — in spite of the weather we had to endure. We hiked three miles the first day with great weather and then it rained the entire rest of the trip — seven days, non-stop rain. Everything we had, even our sleeping bags were soaked. I underestimated how hard it would be to persist through rain and being wet the entire trip. But there was never a question in Montannah’s mind that we weren’t going to the top. Even though she isn’t racing for a place on the podium or training to summit another of the world’s highest peaks, Hollie is still focused on building strength every day in her life. I’ve had to change my focus and goals around physical activity. My main goal now is to never let go of what I have. Always be persistent and active everyday so that I can maintain my health. A healthy balance of different activities is important to me. I coach a running group and the social aspect of that group keeps us all motivated to participate while also making the physical part a lot more fun. Nutritionally, I eat foods that make me feel good and want to be active. Junk food doesn’t give me that feeling while something like a high-protein breakfast does. When I was competing as a triathlete I had iron-deficiency anemia. I started including beef in my breakfasts for added protein and iron. The anemia went away. I’ve continued to eat beef at breakfast as the protein, iron and other nutrients keep me strong throughout my day. You achieve strength through good health, physical activity and a balanced diet. The strength you develop through these areas gives you the power and endurance to live life as your best self. 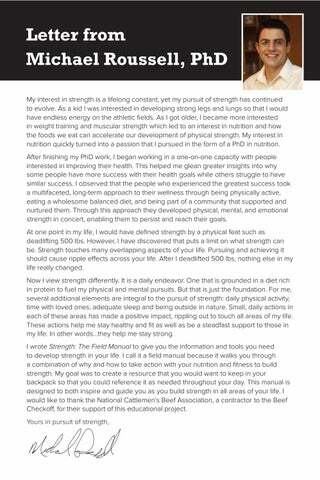 Throughout this field manual we have outlined for you the specific dietary components and strategies needed to build and eat a balanced diet â&#x20AC;&#x201D; a diet that will, in turn support good health, recovery from physical activity, and help you embrace a life of physical, mental and emotional strength. The Four Cornerstones are tried-and-true guidelines grounded in decades of science. The strength of these nutritional cornerstones comes through consistent application, day after day. Strength is a journey, not a destination. You now have the tools for this journey. One meal at a time, you can fuel your best, strongest, self. The author would like to sincerely thank Nancy Rodriguez, PhD, RD, FACSM, and Jess A. Gwin, PhD, for their time and expertise in conducting their peer review of The Strength Field Manual. Matta Mello Portugal E, Cevada T, Sobral Monteiro-Junior R, et al. Neuroscience of exercise: from neurobiology mechanisms to mental health. Neuropsychobiology. 2013;68(1):1-14. Srikanthan P, Karlamangla AS. Muscle Mass Index as a Predictor of Longevity in Older-Adults. Am J Med. 2014;127(6):547-553. Roussell MA, Hill AM, Gaugler TL, et al. Beef in an Optimal Lean Diet study: effects on lipids, lipoproteins, and apolipoproteins. Amer J Clin Nutr. 2012;95(1):9-13. Lavie CJ, Arena R, Swift DL, et al. Exercise and the cardiovascular system: clinical science and cardiovascular outcomes. Circ Res. 2015;117(2):207-219. Deere KC, Clinch J, Holliday K, et al. Obesity is a risk factor for musculoskeletal pain in adolescents: findings from a population-based cohort. Pain. 2012;153(9):1932-1938. Reidy PT, Rasmussen BB. Role of Ingested Amino Acids and Protein in the Promotion of Resistance Exercise-Induced Muscle Protein Anabolism. J Nutr. 2016;146(2):155-183. Morton RW, Murphy KT, McKellar SR, et al. A systematic review, meta-analysis and metaregression of the effect of protein supplementation on resistance training-induced gains in muscle mass and strength in healthy adults. British journal of sports medicine. 2018;52(6):376-384. Liao CD, Tsauo JY, Wu YT, et al. Effects of protein supplementation combined with resistance exercise on body composition and physical function in older adults: a systematic review and meta-analysis. Am J Clin Nutr. 2017;106(4):1078-1091. Aragon AA, Schoenfeld BJ, Wildman R, et al. International society of sports nutrition position stand: diets and body composition. Journal of the International Society of Sports Nutrition. 2017;14:16. Leidy HJ, Clifton PM, Astrup A, et al. The role of protein in weight loss and maintenance. Am J Clin Nutr. 2015. Leidy HJ, Carnell NS, Mattes RD, Campbell WW. Higher protein intake preserves lean mass and satiety with weight loss in pre-obese and obese women. Obesity (Silver Spring, Md). 2007;15(2):421-429. Michaelsen KF, Greer FR. Protein needs early in life and long-term health. Am J Clin Nutr. 2014;99(3):718S-722S. Roussell MA, Hill AM, Gaugler TL, et al. Effects of a DASH-like diet containing lean beef on vascular health. J Hum Hypertens. 2014;28(10):600-605. Mamerow MM, Mettler JA, English KL, et al. Dietary protein distribution positively influences 24-h muscle protein synthesis in healthy adults. J Nutr. 2014;144(6):876-880. Fulgoni VL, 3rd. Current protein intake in America: analysis of the National Health and Nutrition Examination Survey, 2003-2004. Am J Clin Nutr. 2008;87(5):1554s-1557s. Lukaski HC. Magnesium, zinc, and chromium nutriture and physical activity. Am J Clin Nutr. 2000;72(2 Suppl):585s-593s. Sensi SL, Paoletti P, Bush AI, Sekler I. Zinc in the physiology and pathology of the CNS. Nature reviews Neuroscience. 2009;10(11):780-791. Wessels I, Maywald M, Rink L. Zinc as a Gatekeeper of Immune Function. Nutrients. 2017;9(12). 20. Supplements OoD. Zinc: Fact Sheet for Professionals. 2018; https://ods.od.nih.gov/factsheets/ Zinc-HealthProfessional/. Accessed 10/2/18, 2018. 21. Chu A, Petocz P, Samman S. Plasma/Serum Zinc Status During Aerobic Exercise Recovery: A Systematic Review and Meta-Analysis. Sports Med. 2017;47(1):127-134. 22. Supplements OoD. Iron: Fact Sheet for Professional. 2018; https://ods.od.nih.gov/factsheets/ Iron-HealthProfessional/. Accessed 10/2/18, 2018. 23. Le CHH. The Prevalence of Anemia and Moderate-Severe Anemia in the US Population (NHANES 2003-2012). PLoS One. 2016;11(11). 24. Clark SF. Iron deficiency anemia. Nutr Clin Pract. 2008;23(2):128-141. 25. Lanier JB, Park JJ, Callahan RC. Anemia in Older Adults. Am Fam Physician. 2018;98(7):437-442. 26. Cook JD. Adaptation in iron metabolism. The American Journal of Clinical Nutrition. 1990;51(2):301-308. 27. United States. Department of Health and Human Services., United States. Department of Agriculture., United States. Dietary Guidelines Advisory Committee. Dietary guidelines for Americans, 2015-2020. Eighth edition. ed. Washington, D.C.: U.S. Department of Health and Human Services and U.S. Department of Agriculture; 2015. 28. Supplements OoD. Vitamin B12: Fact Sheet for Health Professionals. 2018; https://ods.od.nih. gov/factsheets/VitaminB12-HealthProfessional/. Accessed 10/2/2018, 2018. 29. Smith AD, Warren MJ, Refsum H. Vitamin B12. Advances in food and nutrition research. 2018;83:215-279. 30. Health NIo. Vitamin B12: Fact Sheet for Health Professionals. 2018; https://ods.od.nih.gov/ factsheets/VitaminB12-HealthProfessional/. Accessed Aug 23, 2018. 31. Depeint F, Bruce WR, Shangari N, Mehta R, Oâ&#x20AC;&#x2122;Brien PJ. Mitochondrial function and toxicity: role of the B vitamin family on mitochondrial energy metabolism. Chemico-biological interactions. 2006;163(1-2):94-112. 32. Health NIo. Riboflavin: Fact Sheet for Health Professionals. 2018; https://ods.od.nih.gov/ factsheets/Riboflavin-HealthProfessional/. Accessed Aug 23, 2018. 33. Health NIo. Vitamin B6: Fact Sheet for Health Professionals. 2018; https://ods.od.nih.gov/ factsheets/VitaminB6-HealthProfessional/. Accessed Aug 23, 2018. 34. Medicine USNLo. Niacin. 2018; https://medlineplus.gov/ency/article/002409.htm. Accessed Aug 23, 2018. 35. Supplements OoD. Selenium: Fact Sheet for Health Professionals. 2018; https://ods.od.nih. gov/factsheets/Selenium-HealthProfessional/. Accessed 10/2/18, 2018. 36. Health NIo. Selenium: Fact Sheet for Health Professionals. 2018; https://ods.od.nih.gov/ factsheets/Selenium-HealthProfessional/. Accessed Aug 23, 2018. 37. Keys A, Brozek J, Henschel A, Mickelsen O, Taylor HL. The Biology of Starvation I-II. Minneapolis, MN: University of Minnesota Press;1950. 39. Kerksick CM, Arent S, Schoenfeld BJ, et al. International society of sports nutrition position stand: nutrient timing. J Int Soc Sports Nutr. 2017;14:33. 40. Paddon-Jones D, Westman E, Mattes RD, Wolfe RR, Astrup A, Westerterp-Plantenga M. Protein, weight management, and satiety. Am J Clin Nutr. 2008;87(5):1558s-1561s. 41. Moore DR, Tang JE, Burd NA, Rerecich T, Tarnopolsky MA, Phillips SM. Differential stimulation of myofibrillar and sarcoplasmic protein synthesis with protein ingestion at rest and after resistance exercise. J Physiol. 2009;587(Pt 4):897-904. 42. FDA. Protein. 2018; https://www.choosemyplate.gov/protein-foods. Accessed 10/2/2018, 2018. 43. Nicklas TA, O’Neil CE, Zanovec M, Keast DR, Fulgoni VL, 3rd. Contribution of beef consumption to nutrient intake, diet quality, and food patterns in the diets of the US population. Meat Sci. 2012;90(1):152-158. 44. Phillips SM, Fulgoni VL, 3rd, Heaney RP, Nicklas TA, Slavin JL, Weaver CM. Commonly consumed protein foods contribute to nutrient intake, diet quality, and nutrient adequacy. Am J Clin Nutr. 2015;101(6):1346s-1352s. 45. Newman AB, Lee JS, Visser M, et al. Weight change and the conservation of lean mass in old age: the Health, Aging and Body Composition Study. Am J Clin Nutr. 2005;82(4):872-878; quiz 915-876. 46. Evans WJ. Skeletal muscle loss: cachexia, sarcopenia, and inactivity. Am J Clin Nutr. 2010;91(4):1123s-1127s. 47. Perkin O, McGuigan P, Thompson D, Stokes K. A reduced activity model: a relevant tool for the study of ageing muscle. Biogerontology. 2016;17(3):435-447. 48. Drummond MJ, Dickinson JM, Fry CS, et al. Bed rest impairs skeletal muscle amino acid transporter expression, mTORC1 signaling, and protein synthesis in response to essential amino acids in older adults. Am J Physiol Endocrinol Metab. 2012;302(9):E1113-1122. 49. Galvan E, Arentson-Lantz E, Lamon S, Paddon-Jones D. Protecting Skeletal Muscle with Protein and Amino Acid during Periods of Disuse. Nutrients. 2016;8(7). 50. Symons TB, Sheffield-Moore M, Wolfe RR, Paddon-Jones D. A moderate serving of highquality protein maximally stimulates skeletal muscle protein synthesis in young and elderly subjects. J Am Diet Assoc. 2009;109(9):1582-1586. 51. Norton LE, Layman DK, Bunpo P, Anthony TG, Brana DV, Garlick PJ. The leucine content of a complete meal directs peak activation but not duration of skeletal muscle protein synthesis and mammalian target of rapamycin signaling in rats. J Nutr. 2009;139(6):1103-1109. Park YM, Heden TD, Liu Y, et al. A high-protein breakfast induces greater insulin and glucosedependent insulinotropic peptide responses to a subsequent lunch meal in individuals with type 2 diabetes. J Nutr. 2015;145(3):452-458. 58. Holt SH, Miller JC, Petocz P, Farmakalidis E. A satiety index of common foods. Eur J Clin Nutr. 1995;49(9):675-690. 59. Brennan IM, Luscombe-Marsh ND, Seimon RV, et al. Effects of fat, protein, and carbohydrate and protein load on appetite, plasma cholecystokinin, peptide YY, and ghrelin, and energy intake in lean and obese men. American journal of physiology gastrointestinal and liver physiology. 2012;303(1):G129-140. 60. Astrup A. The satiating power of protein--a key to obesity prevention? Am J Clin Nutr. 2005;82(1):1-2. 61. Foster-Schubert KE, Overduin J, Prudom CE, et al. Acyl and total ghrelin are suppressed strongly by ingested proteins, weakly by lipids, and biphasically by carbohydrates. J Clin Endocrinol Metab. 2008;93(5):1971-1979. 62. Tieken SM, Leidy HJ, Stull AJ, Mattes RD, Schuster RA, Campbell WW. Effects of Solid versus Liquid Meal-replacement Products of Similar Energy Content on Hunger, Satiety, and Appetite-regulating Hormones in Older Adults. Horm Metab Res. 2007;39(5):389-394. 63. Friedman AN. High-protein diets: potential effects on the kidney in renal health and disease. American journal of kidney diseases: the official journal of the National Kidney Foundation. 2004;44(6):950-962. 64. Medicine USNLo. Liver Diseases. 2018; https://medlineplus.gov/liverdiseases.html. Accessed Aug 23, 2018. 65. Wallace TC, Frankenfeld CL. Dietary Protein Intake above the Current RDA and Bone Health: A Systematic Review and Meta-Analysis. J Am Coll Nutr. 2017;36(6):481-496. 66. Heaney RP, Layman DK. Amount and type of protein influences bone health. Am J Clin Nutr. 2008;87(5):1567s-1570s. 67. Bonjour JP. Protein intake and bone health. International journal for vitamin and nutrition research Internationale Zeitschrift fur Vitamin- und Ernahrungsforschung Journal international de vitaminologie et de nutrition. 2011;81(2-3):134-142. 68. Kerstetter JE, Kenny AM, Insogna KL. Dietary protein and skeletal health: a review of recent human research. Curr Opin Lipidol. 2011;22(1):16-20. 69. Landete JM. Dietary intake of natural antioxidants: vitamins and polyphenols. Crit Rev Food Sci Nutr. 2013;53(7):706-721. 70. Kaulmann A, Bohn T. Carotenoids, inflammation, and oxidative stress--implications of cellular signaling pathways and relation to chronic disease prevention. Nutr Res. 2014;34(11):907-929. 71. Whelton PK, Carey RM, Aronow WS, et al. 2017 ACC/AHA/AAPA/ABC/ACPM/AGS/APhA/ASH/ ASPC/NMA/PCNA Guideline for the Prevention, Detection, Evaluation, and Management of High Blood Pressure in Adults: A Report of the American College of Cardiology/ American Heart Association Task Force on Clinical Practice Guidelines. Hypertension. 2018;71(6):e13-e115. 72. Wing RR. Long-term effects of a lifestyle intervention on weight and cardiovascular risk factors in individuals with type 2 diabetes mellitus: four-year results of the Look AHEAD trial. Arch Intern Med. 2010;170(17):1566-1575. 73. Organization WH. WHO Factsheet No. 311. http://www.who.int/mediacentre/factsheets/fs311/ en/]. Accessed Aug 23, 2018. 74. Larsen TM, Dalskov SM, van Baak M, et al. Diets with High or Low Protein Content and Glycemic Index for Weight-Loss Maintenance. N Engl J Med. 2010;363(22):2102-2113. 75. Ludwig DS, Ebbeling CB. Weight-Loss Maintenance â&#x20AC;&#x201D; Mind over Matter? N Engl J Med. 2010;363(22):2159-2161. 76. National Heart L, and Blood Institute. DASH Eating Plan. https://www.nhlbi.nih.gov/healthtopics/dash-eating-plan. Accessed Aug 23, 2018. 77. Roe LS, Meengs JS, Rolls BJ. Salad and satiety: the effect of timing of salad consumption on meal energy intake. Appetite. 2012;58(1):242-248. 78. Rolls BJ, Roe LS, Meengs JS. Salad and satiety: energy density and portion size of a firstcourse salad affect energy intake at lunch. J Am Diet Assoc. 2004;104(10):1570-1576. 79. Shukla AP, Iliescu RG, Thomas CE, Aronne LJ. Food Order Has a Significant Impact on Postprandial Glucose and Insulin Levels. Diabetes Care. 2015;38(7):e98-99. 80. Grundy SM, Cleeman JI, Merz CNB, et al. Implications of Recent Clinical Trials for the National Cholesterol Education Program Adult Treatment Panel III Guidelines. Circulation. 2004;110(2):227-239. 81. Silva FM, Kramer CK, de Almeida JC, Steemburgo T, Gross JL, Azevedo MJ. Fiber intake and glycemic control in patients with type 2 diabetes mellitus: a systematic review with metaanalysis of randomized controlled trials. Nutr Rev. 2013;71(12):790-801. 82. Markowiak P, Slizewska K. Effects of Probiotics, Prebiotics, and Synbiotics on Human Health. Nutrients. 2017;9(9). 83. Jenkins DJ, Jenkins AL. Dietary fiber and the glycemic response. Proc Soc Exp Biol Med. 1985;180(3):422-431. 84. Ho HV, Sievenpiper JL, Zurbau A, et al. The effect of oat beta-glucan on LDL-cholesterol, non-HDL-cholesterol and apoB for CVD risk reduction: a systematic review and meta-analysis of randomised-controlled trials. Br J Nutr. 2016;116(8):1369-1382. 85. US Department of Agriculture, Agricultural Research Service, Nutrient Data Laboratory. USDA National Nutrient Database for Standard Reference, Legacy. Version Current: April 2018. Internet: /nea/bhnrc/ndl 86. King JC, Slavin JL. White potatoes, human health, and dietary guidance. Advances in nutrition (Bethesda, Md). 2013;4(3):393s-401s. 87. Keenan MJ, Zhou J, Hegsted M, et al. Role of resistant starch in improving gut health, adiposity, and insulin resistance. Advances in nutrition (Bethesda, Md). 2015;6(2):198-205. 88. Bindels LB, Walter J, Ramer-Tait AE. Resistant starches for the management of metabolic diseases. Curr Opin Clin Nutr Metab Care. 2015;18(6):559-565. 89. Prevention CfDCa. Perceived Exertion (Borg Rating of Perceived Exertion Scale). 2018; https:// www.cdc.gov/physicalactivity/basics/measuring/exertion.htm. Accessed Aug 23, 2018. 90. Jeukendrup A, Gleeson M. Sports Nutrition - 2nd Edition. 2nd ed: Human Kinetics; 2009. 91. McArdle W, Katch F, Katch V. Sports and Exercise Nutrition. Lippencott Williams & Wilkins; 2009. 94. Committee PAA. 2018 Physical Activity Guidelines Advisory Committee Scientific Report. 2018. 95. Stokes T, Hector AJ, Morton RW, McGlory C, Phillips SM. Recent Perspectives Regarding the Role of Dietary Protein for the Promotion of Muscle Hypertrophy with Resistance Exercise Training. Nutrients. 2018;10(2). 96. Drummond MJ, Rasmussen BB. Leucine-enriched nutrients and the regulation of mammalian target of rapamycin signalling and human skeletal muscle protein synthesis. Curr Opin Clin Nutr Metab Care. 2008;11(3):222-226. 97. Pennings B, Groen BB, van Dijk JW, et al. Minced beef is more rapidly digested and absorbed than beef steak, resulting in greater postprandial protein retention in older men. Am J Clin Nutr. 2013;98(1):121-128. 98. Boirie Y, Dangin M, Gachon P, Vasson MP, Maubois JL, Beaufrere B. Slow and fast dietary proteins differently modulate postprandial protein accretion. Proc Natl Acad Sci USA. 1997;94(26):14930-14935. 99. Symons TB, Sheffield-Moore M, Mamerow MM, Wolfe RR, Paddon-Jones D. The anabolic response to resistance exercise and a protein-rich meal is not diminished by age. | J Nutr Health Aging. 2011;15(5):376-381. 100. Richter EA, Hargreaves M. Exercise, GLUT4, and skeletal muscle glucose uptake. Physiol Rev. 2013;93(3):993-1017. 101. Churchward-Venne TA, Holwerda AM, Phillips SM, van Loon LJ. What is the Optimal Amount of Protein to Support Post-Exercise Skeletal Muscle Reconditioning in the Older Adult? Sports Med. 2016;46(9):1205-1212. 102. Sawka MN, Burke LM, Eichner ER, Maughan RJ, Montain SJ, Stachenfeld NS. American College of Sports Medicine position stand. Exercise and fluid replacement. Med Sci Sports Exerc. 2007;39(2):377-390. 103. Thun E, Bjorvatn B, Flo E, Harris A, Pallesen S. Sleep, circadian rhythms, and athletic performance. Sleep medicine reviews. 2015;23:1-9. 104. Barnes CM, Drake CL. Prioritizing Sleep Health: Public Health Policy Recommendations. Perspectives on psychological science : a journal of the Association for Psychological Science. 2015;10(6):733-737. 105. Kreutzmann JC, Havekes R, Abel T, Meerlo P. Sleep deprivation and hippocampal vulnerability: changes in neuronal plasticity, neurogenesis and cognitive function. Neuroscience. 2015;309:173-190. 106. Hirshkowitz M, Whiton K, Albert SM, et al. National Sleep Foundationâ&#x20AC;&#x2122;s updated sleep duration recommendations: final report. Sleep health. 2015;1(4):233-243. 107. Bano M, Chiaromanni F, Corrias M, et al. The influence of environmental factors on sleep quality in hospitalized medical patients. Frontiers in neurology. 2014;5:267. 108. Gilbert SS, van den Heuvel CJ, Ferguson SA, Dawson D. Thermoregulation as a sleep signalling system. Sleep medicine reviews. 2004;8(2):81-93. 109. Stults-Kolehmainen MA, Bartholomew JB, Sinha R. Chronic Psychological Stress Impairs Recovery of Muscular Function and Somatic Sensations Over a 96-Hour Period. The Journal of Strength & Conditioning Research. 2014;28(7). 110. Russo MA, Santarelli DM, Oâ&#x20AC;&#x2122;Rourke D. The physiological effects of slow breathing in the healthy human. Breathe. 2017;13(4):298-309. Sharma VK, Trakroo M, Subramaniam V, Rajajeyakumar M, Bhavanani AB, Sahai A. Effect of fast and slow pranayama on perceived stress and cardiovascular parameters in young health-care students. International Journal of Yoga. 2013;6(2):104-110.